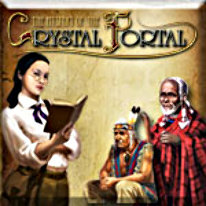 Discover the Mystery of the Crystal Portal as you embark on a brain-bending adventure that's full of unique hidden object fun. Journalist Nicole Rankwist has always been close to her archaeologist father, so when he goes missing, Nicole knows she has to find him. After all, he had apparently just made a discovery that could "change the course of humanity." Join Nicole as she searches the globe on an eye-popping quest to find her father and discover the truth behind the Crystal Portal. Featuring innovative hidden object gameplay, an intriguing storyline, and stunning full-screen graphics, The Mystery of the Crystal Portal is a thrilling escape for the whole family.